Deep venous thrombosis occurs when a blood clot forms in the leg or thigh and the clot moves to the heart, lungs or brain. The Chicago deep venous thrombosis injury attorneys of Rosenfeld Injury Lawyers LLC have represented numerous clients who developed these clots while under the care of a doctor or hospital and suffered from serious medical complications. It is important for all doctors and hospitals to recognize when patients are deemed high risk for blood clots and to make appropriate efforts to monitor these patients for signs of a clot. The failure to promptly treat patients with DVT can have catastrophic consequences. 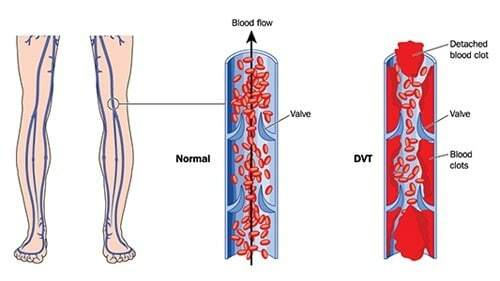 What DVT is and how it is Diagnosed? Deep venous thrombosis occurs when a blood clot develops in the larger veins located in the lower leg or thigh and may or may not be accompanied by symptoms. Those who are at the greatest risk of developing blood clots are those who have undergone recent surgery, suffered physical trauma or suffered severe burns. The common denominator in all of these cases is that the body is healing and blood clotting is a natural and integral part of the healing process. When clots form in the bloodstream rather than at the location of an injury, however, they can become problematic. The symptoms of DVT include pain and discomfort in one leg, a tender feeling to the touch, a warm or hot feeling in the leg, visible changes in the tone of the skin and swelling. A blood clot in the leg often becomes dislodged, solving the issue temporarily, but posing the risk of heart attack, pulmonary embolism or stroke if the clot does not break apart prior to reaching the heart, lungs or brain. Therefore, failure to diagnose and treat DVT can have fatal consequences. One of the most common ways to treat blood clots is to administer blood thinning medications, which break up existing clots and prevent the formation of others. If a patient is at high risk for the development of blood clots, these medications can be used as a preventative measure, but they do not come without risks of their own. Patients on blood thinners should undergo regular blood monitoring to ensure that they are not at risk of excessive or uncontrolled bleeding. Other ways to prevent blood clots include the use of pressure socks or stockings. These increase blood flow and decrease the risk of DVT by not allowing blood to accumulate in the veins of the leg. Surgical options are also available both to prevent and treat DVT. During these procedures, a filter is placed in the vein of the leg or clots are physically removed and discarded to prevent them from moving to the lungs, heart or brain. Our Chicago DVT lawyers frequently represent patients who did not receive preventative care to prevent clots or who developed clots that doctors failed to diagnose, resulting in pulmonary embolism, heart attack or stroke. As mentioned before, the failure to prevent or notice the development of a blood clot in time can have a serious impact on the health of the patient. The injuries that we have most commonly observed due to the failure to diagnose deep venous thrombosis include the following. Pulmonary embolism. This occurs when the blood clot reaches the lungs and causes shortness of breath, intense pain in the chest and blood-streaked phlegm. When not treated in time, the condition can be fatal. Heart attack. The blockage of major blood vessels in the heart due to the migration of a blood clot can result in a heart attack. In some cases, emergency bypass surgery is required to restore blood flow. Ischemic stroke due to cerebral embolism. About 87% of strokes occur due to blockages in the blood vessels of the brain, which are classified as ischemic strokes. Cerebral embolism is classified as a clot that moves to the brain rather than one that forms at the location of the blockage. The victim in this thrombosis case was eighty-four. He lived in a nursing home. He had a long history of vein issues and other problems. For the deep vein thrombosis, his doctors prescribed Lovenox to treat it. They applied this subcutaneously on the abdomen. On one occasion, a nurse applied the Lovenox right on the muscle. This created hematoma in the abdominal wall as well as bleeding, shock, and other problems. He died not long after this error. Lawyers for the estate sued the nurse and the nursing home. The lawsuit alleged the defendants’ negligence caused the man’s death and the related pain, loss, and expenses. They sought compensation for all the damages that their wrongful conduct caused. Both sides settled out of court for $400,000. The dispute here began relatively innocently enough. The man involved was young, in his forties. He injured his knee, so he saw an orthopedic doctor. That physician adjusted his cast and ordered another surgery. The patient came back for the treatment. During intubation, he suffered a stroke. Apparently, deep vein thrombosis formed and went into his lungs. The stroke sent him into shock, and he died a few days later. Lawyers for the estate claimed the doctors were negligent and responsible for his wrongful death. They set forth in the complaint that the defendants should have noted the man’s pre-existing conditions and checked for signs of deep vein thrombosis. These errors led to his death and caused his damages. A jury agreed and awarded the plaintiffs over $5 million for lost wages, medical bills, lost society, grief, and other losses. This case reminds us how quickly thrombosis issues can escalate. The patient was a man in his late forties. He worked as an engineer for a train company. He had a wife and three kids. Pain and numbness emerged in his leg despite no traumatic event. He went to see the doctor about this. The doctor examined him but did not conduct an ultrasound. Consequently, the physician missed the fact that the man had deep vein thrombosis. It progressed over the next two to three days. Eventually, he suffered a pulmonary embolism and died. He was survived by his family. They sued the doctor and facility involved. They claimed the defendants’ negligence caused their loved one’s wrongful death. The defendant summarily filed a reply. However, the egregiousness of their mistakes could not be explained. They decided to settle rather than explain them in court. The relevant events of this lawsuit arose after the patient had surgery. He had an operation to repair tendons in quads. He injured them at work. His doctors claimed they instructed him to take various medications. He did not take anything to treat embolisms that might form. Over the next few weeks, he followed up with doctors. None of them checked to see if he was on anything for thrombosis. Consequently, he did suffer and die from a pulmonary embolism brought on by deep vein thrombosis. His family filed a lawsuit against the doctors and facility where he received treatment. They alleged that they should have checked for and prevented against this development. Their failure to do so caused his wrongful death. The defendants argued that they cared for him reasonably, this was a known risk, and they did all that they could. However, the veracity of these claims cannot be weighed, because they settled a few months later. The family received $2 million for their pain, loss, and expense. If you have been the victim of malpractice due to the failure of hospital staff to prevent or diagnose the formation of a blood clot, Rosenfeld Injury Lawyers LLC can help you recover the greatest amount of compensation allowed by Illinois law. We’ve represented thousands of clients across the state and are happy to review your case at no risk or cost during a free consultation. Our Chicago deep venous thrombosis attorneys work on a contingency basis, which means that we only collect attorneys’ fees after we’ve successfully negotiated a settlement or taken your case to court and won a judgment in your favor. If we cannot collect compensation for you, we will not charge you a thing for our time or services.